So, you've been waiting over a year for a pattern for the side-snapping soaker. Well, here is a testing pattern. I have not gotten a chance to sew one from it yet, and so I do not have a picture tutorial yet. I will hopefully get that done this week. The one shown is the one I made last year and was done with PUL and fleece. For that kind, I suggest sizing up on the body of the soaker but keeping the waistband and leg cuffs the size you actually need. Cut out the soaker pattern you need. Fold the edges (formerly the side seams) in one inch in the front, and 7/8" in the back. The wrong sides should be together when you do this so that you have a neat looking front. Stitch these down. Fold the short edges of you waistband pieces in 1/2" with wrong sides together. Stitch these down. Then fold the long sides together (wrong sides together) and stitch the raw edges together with the raw edges of the soaker body, stretching the waistband to fit along the soaker. Do the same with your leg cuffs. Once all of the pieces of your soaker are together, center your snaps in the waistband at the edge, center them in the leg cuffs at the edge, and center them in the sides of the soaker. I know these instructions leave a lot to be desired, but I will try to get some pictures up soon. A lovely lady on the Diaper Sewing Divas board put up a tutorial on how to convert the soakers into snapping ones, and her design is beautiful. When we get it worked up, I'll post the pattern alterations and a picture tutorial. Until then, I am working on alterations for making PUL/fleece covers from the soaker patterns. It doesn't take a lot of alterations to make one of these. The one in this picture (the red one) was made with the large pattern for the body and the medium pattern for the waistband and leg cuffs. It fits my 25 lb one year old (his birthday is Saturday) perfectly. It is shown next to a white, size medium Stacinator PUL/fleece cover and on my beautiful baby boy. Hopefully, I'll be able to add a tutorial and patterns for this soon. This is the last wool soaker that I sewed. I believe it was a small. Since the wool blend interlock was so stretchy, I made the waistband smaller so that it would stay on better. 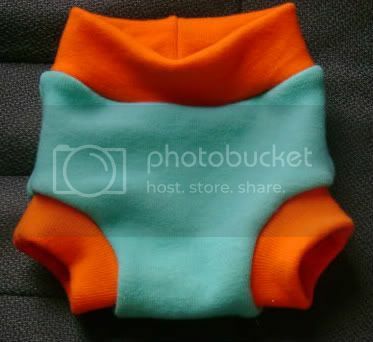 I would have put up some modeling shots, but at the time I made this one, I didn't have anyone small enough to wear it. I sold it. I hope the recipient enjoyed it. It was some nice, thick wool. Okay, so I was skeptical about the whole Swag Buck thing. I mean, really, I could get actual money, giftcards, or other stuff without jumping through a bunch of hoops? I didn't think so. Today, I received $10 in my PayPal account from Swag Bucks. All I did was stuff I was already doing. I got swagbucks by searching the web and by buying stuff online. I also answered a couple of surveys for extra swagbucks. I nearly have enough for another $5 in PayPal. I guess this is my answer to buying fabric now that my local Walmart quit selling it. I'll be buying online with my PayPal! I signed up 3 months ago. I'm never good at finding the swagcodes, but I still am collecting the swagbucks with my online searches. I also get one swagbuck each day from the daily poll and another one for just checking to see what's listed in the Trusted Surveys. It takes 700 swagbucks for $5 in PayPal, but you can get a $5 Amazon e-giftcard for 450 swagbucks. Anyway, if you want to sign up, there's a link on the right, or you can click here. That's my referal link. If you refer someone you can earn up to 1000 swagbucks right along with them when they do online searches. Our newest addition to the family! Born on Friday, April 16th at 4:34 p.m. Need elastic in the waistband and legs? Do you like the look of the waistband and leg cuffs but wish they had more stretch? 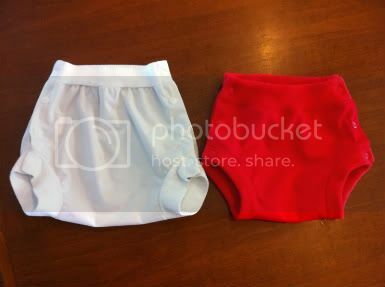 Thanks to Sew*Chic Mama, you can add elastic to the your soaker following her tutorial. You can follow these instructions to add elastic to the waistband of your longies as well. 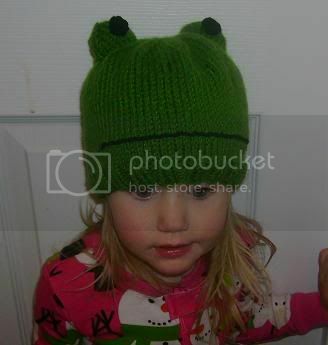 Here is a frog hat I knitted for my nephew. It's being modeled by my 3 year old daughter. How many soakers can I make with a yard of fleece? 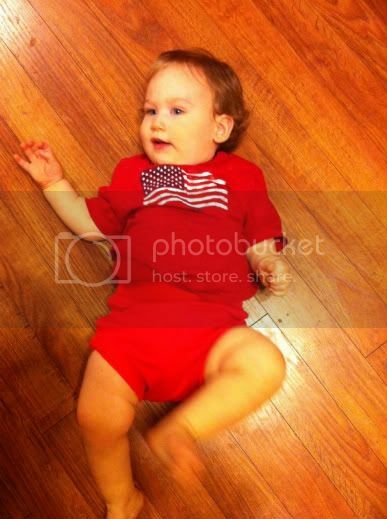 Home of the Free RRP Diaper pattern!